Floyd makes the Mister and I laugh every. single. day. Sometimes it is because he's so cute and sweet and sometimes it is because he's a silly little man. He trips every day and usually it is over nothing. The other day I caught him wagging his tail and his tail rubbed against his back. He whipped his head around in defense as if something was attacking him. It was your tail, Bud. Your own tail. Floyd has a nervous belly. He's had it since we got him. He often gets a Pepcid every night with dinner. He grunts, groans and glares all the time. He's a talker, that's for sure. 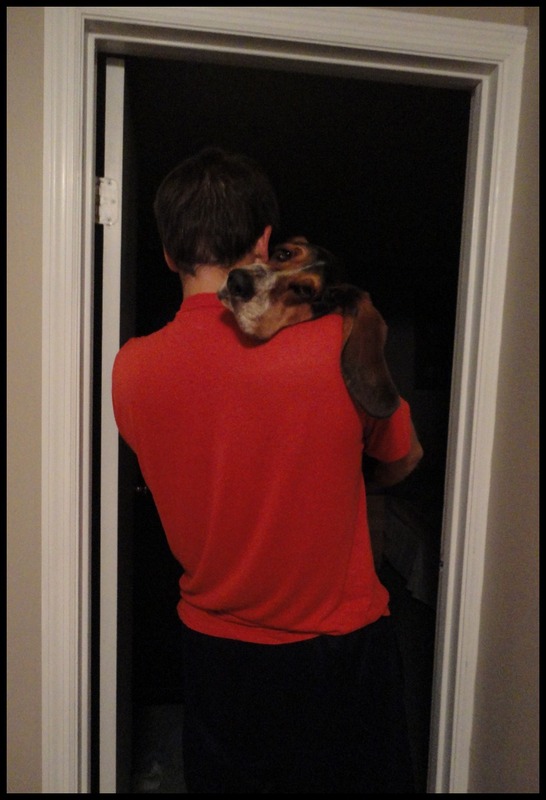 Floyd gets carried to bed every single night. He also growls in his sleep every single night while being carried to bed. He is filled to the brim with love and licks and never meets a stranger. Floyd loves his routines (I can't say I blame him, I do too). He does the same things every day, in the same order and at the same time. Every single time the Mister gets up from the sofa Floyd steals his seat. And I laugh every time. And in today's extra exciting news: Im over HERE today!! Come visit, show Emily some love and check out my latest DIY adventure! Thanks again to Emily for having me over! haha! to cute. i love that floyd gets carried to bed every night. He is so so darn cute! Wuv! Oh my goodness - he is adorable!! Welcome! I'm so glad you stumbled upon my blog and linked up! 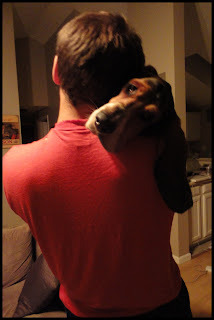 Floyd I can say with 100% certainty is my only basset that has ever been shown in a link up! I can't believe y'all carry him to bed! LOL what a load! Haha this is soooo precious!